A Gurn from Nurn: The Gurn has authority! Yes we have authority! So say the professionals at Technorati. 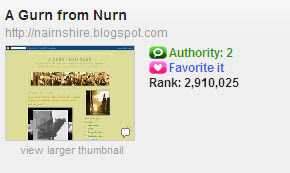 We are simply the two million, nine hundred and ten thousand and twenty-fifth best blog in the world. 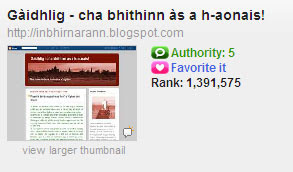 Unfortunately we cannot keep up with the authority of the Gurn's sister blog the sensational Gàidhlig: cha bhithinn às a h-aonais which will soon be the best blog in the universe. You will not need to read this T-Shirt then!